I was the Head of Policy and Public Affairs at UNISON Scotland until my retirement in September 2018. I now work on several policy development projects, so all views are very definitely my own. You can also follow me on Twitter. I hope you find this blog interesting and I would welcome your comments. The Tories and SNP may well be playing with the EU Withdrawal Bill for political reasons, but there are important reasons why those who support devolution should be concerned. The EU Withdrawal Bill heads back to the House of Commons after some serious mauling in the House of Lords. UK headlines focus on the EEA and customs union amendments, but the Clause 11 issues, relating to devolved powers, remain unresolved. This means that Holyrood is likely to withhold consent for the Bill, leaving the UK Supreme Court to rule on the competency of the Scottish Parliament's Continuity Bill. The dispute revolves around consent for UK frameworks on powers that come back to the UK from the EU in areas of competence that are devolved. The UK government wants to retain control over 24 areas to create UK frameworks that they claim are necessary to maintain a single UK internal market. The Scottish Government doesn't dispute the need for frameworks, but argues that these must be agreed by consent because a UK veto would undermine the principles of devolution. The original Clause 11 was opposed by almost everyone, including the Scottish Conservatives. However, they, and others, now argue that the new clause is a reasonable compromise creating a set of procedural hoops the UK government must jump through before it gets the powers it needs to make frameworks. This also means that repatriated powers in devolved areas will go to Holyrood automatically, unless Westminster specifically reserves some for a few years through regulations. The Welsh government has signed up to this compromise and Lord Hope, who tabled, but didn't push to a vote, some helpful amendments supported by the Scottish Government, appears to partly agree. He argues that the Scotland Act was not designed for a Brexit situation, so a more subtle, pragmatic solution is required. The Scottish Government argues that this is a matter of principle, while the UK government argues that the Scottish Parliament cannot have a veto on UK legislation. I think there is an important principle at stake. This includes a defence of the hugely important Dewar amendment, which embodied the principle that all powers are devolved unless they are specifically reserved. This was not the position in Wales until the 2017 Act, so I appreciate that they may not view this matter in the same way as we do in Scotland. However, it goes wider than that. The 24 areas that the UK government wants to have its own veto over are already clearly devolved areas. The current Clause 11 would give them the power to interfere, not just with new powers coming from the EU, but existing legislation. A particular concern for me is procurement. Scottish legislation and statutory guidance may be more timid than I would wish, but it's a lot a better than anything the UK government would support. If this debate appears to be a bit arcane, let me give a practical example. A care worker in Scotland should receive the Scottish Living Wage thanks to our procurement rules. This could be ended by the UK Government, using Clause 11. A pay cut is not in the slightest bit arcane! Then there is the 'veto' argument of the Tories which claims the Scottish Government wants to extend the powers of the Scotland Act to block UK legislation. A line reinforced by the usually more sensible Tory MSP Adam Tompkins in Scotland on Sunday. This is highly misleading. 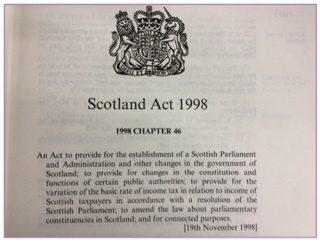 Of course it is the case that s28 of the Scotland Act 1998 gives Westminster the power to legislate on Scottish matters, but the principle in the Sewell Convention, incorporated into the 2016 Act, was that they would not normally do that. This is not a veto on UK legislation. It just means that UK legislation would not apply in Scotland without the consent of the Scottish Parliament. That leaves the UK government with the option of amending their legislation to get the Scottish Parliament's consent, or excluding Scotland from the geographical scope of the Bill. As a consequence of devolution, we don't have a single market in many areas. If you are a UK firm trading in Scotland, you already have to deal with different rules between England and the devolved administrations. Procurement is again a good example, but there are many others. In fact, some of these pre-date devolution in Scotland. New EU powers may add to these, but it isn't a new challenge. So, the nationalists and the unionists may pose on constitutional principles and use the dispute to further their politcal strategies. Those who support a devolved or federal model for the UK should focus on defending the devolution settlement. There is a pragmatic solution to be found that resolves differences over UK frameworks, while respecting both parliaments. What's missing is the political will. The Escorts in Lahore are the best choice with no doubt as you can choose them so as to have fun in the naughtiest way. They will are young and can make you feel young also, regarding sure they are all over too good also if you are willing to choose the Escorts in Lahore if you choice also. Generally there is no doubt whatsoever that this is the best choice also just like you are looking in the manner to choose the bubbly women then the Lahore VERY IMPORTANT PERSONAL Escorts are the best to choose all over. I was the Head of Policy and Public Affairs at UNISON until my retirement in September 2018. I am a Board member at the Reid Foundation, Secretary of the Keir Hardie Society and Secretary of the Socialist Health Association Scotland. Past Chair of the Scottish Labour Party. Graduate in Law from University of Strathclyde. Fellow of the RSA. I have worked in government and in the public sector. I am the author of chapters in several books and a range of publications.